1.) 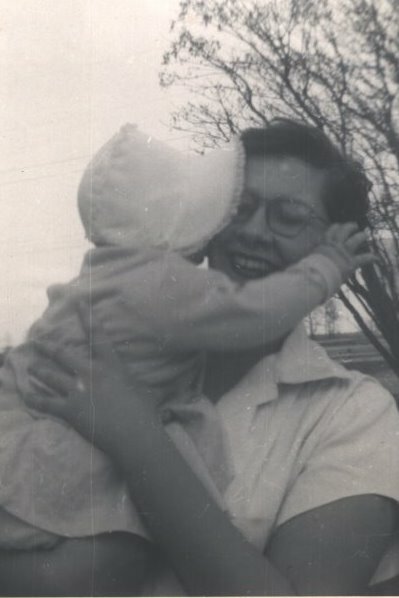 Tomorrow is my sister, June’s, birthday. She’s always been there to listen and encourage me; she “had my back” before the phrase was ever invented. Happy Birthday, June. 2.) Our Christmas card envelopes are addressed and cards are almost finished. 3.) 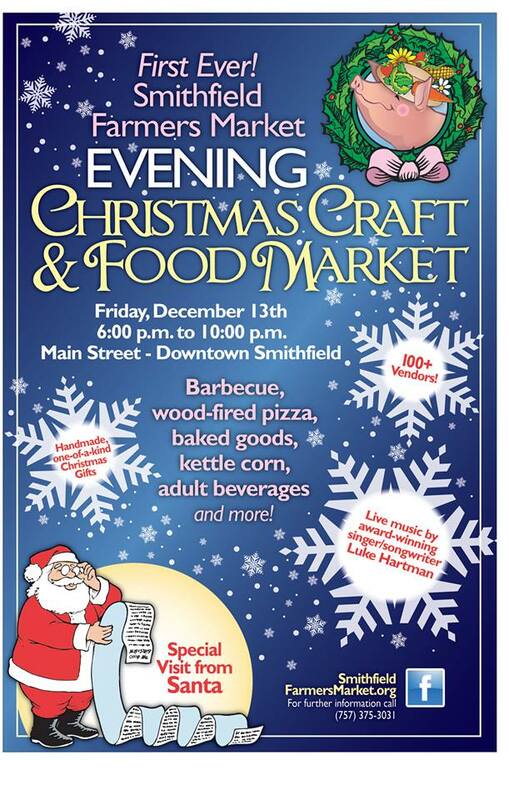 Tonight in our little town of Smithfield is an evening Christmas Craft and Farmers’ Market. Motor Man and I are planning to attend. Isn’t this a pretty flyer created for the event? 4.) Speaking of Christmas, Sundae continues to keep watch under the tree. Oh, look: prezzies! 5,) Still speaking of Christmas, we couldn’t believe this when we spotted it last night. 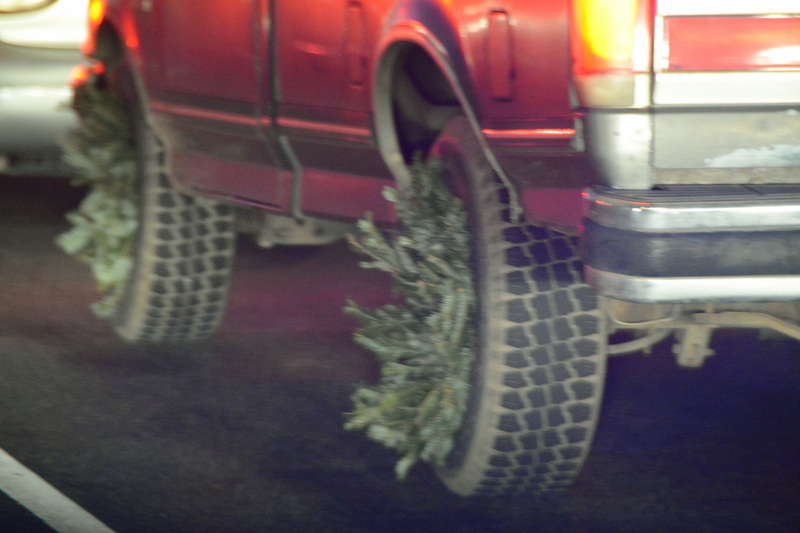 You know the saying: you may be a redneck if….you have Christmas wreaths on the tires of your pick-up truck. Since four of my five thoughts today relate to Christmas, I suppose they aren’t so random. But, after all, tis the season! Are your thoughts all about Christmas this week? This entry was posted in Family and tagged calico kitty, christmas tree, smithfield va christmas farmers market, wreaths on tires. Bookmark the permalink. Sundae looks so pretty under the tree! Please tell June I said HAPPY BIRTHDAY and we miss her on Sam’s blog……as for the wreaths on the tires….well….what can I say except “YEEEE HAAAWWW HAPPY HOLIDAY!!! !” 🙂 That’s what I call “over-decorating” ! The tire wreaths was definitely an original idea! Thank you both for the birthday wishes. Donna sent me a huge present that arrived Mon. And I have had to look at it all week!! What are big sisters for, if not to watch out for our baby sisters. Ha ha ha! I have never, ever seen wreaths on tires of a truck – that’s classic! Sundae has claimed that tree for her own – just being near it all the time! Motor Man and I are both fighting colds, so we didn’t make it to the craft market. Marshall said it was a huge success though! My sincerest birthday wishes to June! What a fine catch of a photo you caught of those truck tires! I assume you caught them in motion. I will have to tell GS1 about those wreaths on the tires…he noticed an SUV with a Rudolph nose the other day when we were on the road which really tickled him. Have a wonderful weekend. Thanks, Georgette. Actually we had stopped at a stoplight when I snapped the pic of the tire wreaths. I’m surprised it turned out as well as it did; I had to turn off the flash so it wouldn’t flash against the window of our vehicle. Motor Man is still trying to figure out how those wreaths are attached to stay on there as that truck travels down the highway! Happy Birthday, June!!! The Most Precious picture of you and sis! Love, love, love Sundae under the tree. Precious. Happy Birthday June. Happy birthday to June! Wood-fired pizza sounds good! Bundle up! That isn’t Motor Man’s truck with wreaths, is it? Sundae is so pretty, guarding the gifts. When I can think, it is usually about where to shop next! No, that isn’t MM’s truck! But he does wonder how those wreaths are attached…! We are both fighting colds and didn’t make it to the craft market. We heard it was a huge success though! I hope you both feel better soon. Sorry you missed the craft market, etc. Happy Birthday to your sister! Loved your random thoughts today. Those wreaths on the pick-up cracked me up! Wreaths on the tire rims… that is something else! My son was pretty excited to see a few cars dressed up like reindeer the other day! Motor Man spotted these wreaths and said he’d seen it all now! That is indeed a great flyer and the pine tree boughs/wreaths whatever on the tires? Hahahaha…I’ve never seen that one. I love it and It makes me smile! My thoughts on Christmas this week…”Starting to get crazy fun!” Big hockey skate/game here at the farm tonight. Can’t wait to watch all the antics!! Welcome back, Dee!! I got your e-mail – just haven’t had a chance to respond. Hope you had a great time at the game tonight! We didn’t make it to the craft market. MM and I are both sick with colds, and just didn’t feel like going. Plus it wouldn’t have been good for us to be out in the “night air” as my Mom used to say. Hope you enjoyed your “beverage” on the porch! Well at least you both have it together at the same time. I am sure you have already heard that.. 🙂 CH had the stuffy head and runny nose miserable cold a couple of weeks ago. Over in about 5 days. I escaped it! Take care! the tire wreaths are great! hi sundae! Oh! Happy birthday to June! And look at my furrend Sundae under your tree!!! Hi, Nellie! Sundae does LOVE that tree! She’s going to be disappointed when Christmas is over and we take it down! Happy Birthday to June! Connie and Martha are going to the event tonight you may run in to them. 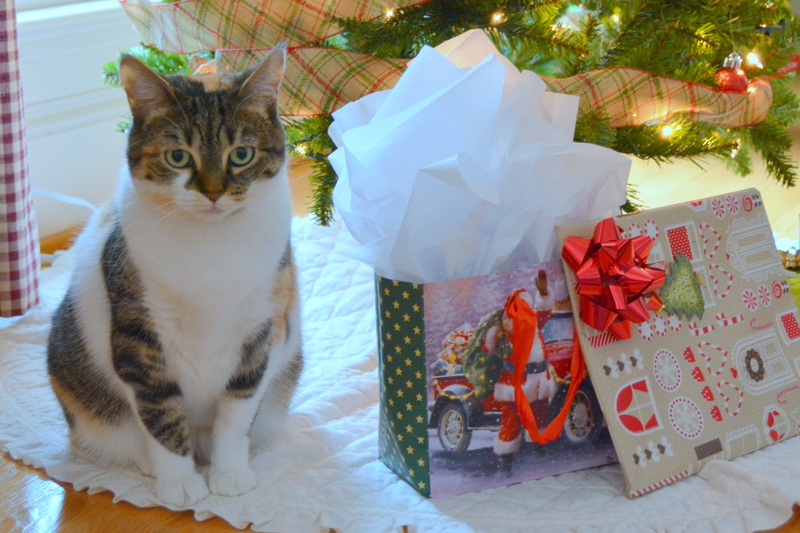 Sundae is just trying to be a good kitty and guard your presents. Wreathes on tires, I have seem everything now! The Christmas Market sounds like a lot of fun. Hope you’ll have a post on it in the upcoming week.